Marque Four Piece Reception Station with Plexi - 142"W x 90"D Cherry Finish/Silver Accents Dimensions: 142"W x 90"D x 45.5"H Weight: 492 lbs. OFM Marque collection four unit reception station is constructed of durable, commercial-grade engineered wood with an attractive laminate finish and a translucent plexi-panel for a contemporary look; Reception station features striking silver accents that enhance its eye-catching modern style. Luminary Reception Station Cherry Finish Dimensions: 72"W x 36"D x 43.25"H Weight: 432 lbs. 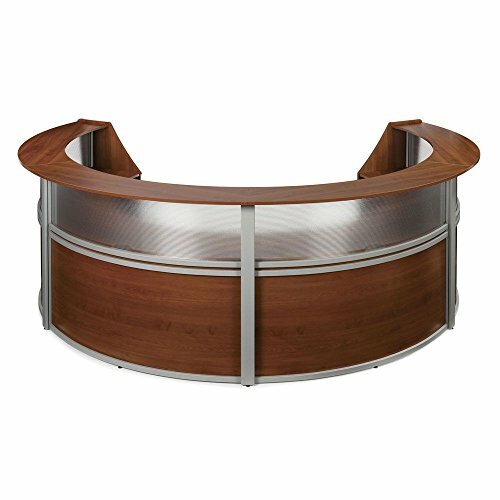 Marque Curved Three Piece Reception Station with Plexi - 142"W x 71"D Walnut Finish/Silver Accents Dimensions: 142"W x 71"D x 45.5"H Weight: 355 lbs. Reception Station with Left Return Bourbon Cherry Finish Dimensions: 72"W x 87"D x 45"H Weight: 583 lbs. Marque Curved Double Reception Station - 124.25"W x 49"D Cherry/Silver Accents Dimensions: 124.25"W x 49"D x 45.5"H Weight: 250 lbs. Double Glass Top Reception Desk - 190"W x 64"D Driftwood Laminate/Silver Laminate Kick Plates and Accents/Glass Counter Dimensions: 190"W x 64"D x 42"H Weight: 752 lbs.